The ascendance of the search engine has done nothing to stem the tide of the Web’s original filter: the personal Web log. Julian Dibbell gets inside the obsessions of one of the Web’s most prolific bloggers. First published in FEED online magazine, May 3, 2000. Reprinted in We’ve Got Blog: How Weblogs Are Changing Our Culture, edited by Rebecca Blood (Perseus, 2002). JORN BARGER IS A COLLECTOR, of a sort — though you wouldn’t know what sort, exactly, from gazing on his worldly possessions. A long-haired, thick-bearded former artificial-intelligence (AI) programmer in his forties, Barger lives in genteel poverty, sharing an apartment with roommates in Chicago’s scruffy West Rogers Park neighborhood. His bedroom once held a lot of books, but he had to sell them off some time ago; the principal fixtures remaining are a secondhand Macintosh with built-in television, a boom-box radio, and a bed. Barger spends his days in the bed, and there — sitting with the Mac’s keyboard in his lap and its monitor beside him — he collects: A color-coded map of the world’s language families. A discussion of the various titles Proust considered and discarded for Remembrance of Things Past. A National Enquirer article on “who’s doing yoga in Hollywood.” A BBC item on the evolution of cooperation among capuchin monkeys. Some photos of Fisher-Price Little People repainted as characters from Futurama. A FAIR analysis of recent mainstream news coverage of the IMF and the World Bank. An oddly evocative Webcam shot from the Jennicam Web site. A tribute to the Spanish-language children’s television show El Club de los Tigritos. A compilation of Noam Chomsky resources on the Web. A detailed list of textual correspondences between James Joyce’s Ulysses and Homer’s Odyssey. A phrase that Barger dreamed last night on the edge of waking. All these items — and many, many more — have been collected over the years as links on Barger’s Web site, Robot Wisdom. His collection is what’s known these days as a Web log, or, to its friends, a “blog” — a regularly updated site containing links to pages the author finds interesting, typically with commentary attached. Barger coined the term himself when he started his Web log in 1997, though he was hardly the first person to have kept one. For as long as there have been browsers, there have been surfers gathering and sharing their favorite finds. The father of browsers himself — Mosaic author Marc Andreessen — is sometimes cited as the founding blogger, for the seminal What’s New page he maintained in the early days of the Web. But Web logs have come a long way since then, and Barger — well, Barger has plainly taken the concept to another level altogether. The word “obsession” comes to mind, though “passion,” I suppose, is a kinder and maybe fairer name for what drives him to blog. He derives no revenues from the Robot Wisdom site; there are no advertisements on it, banner or otherwise. There are hardly any graphics at all, in fact. Just links — miles and miles of them, discerningly selected, pithily annotated, stacked one on top of another all the way down the main page and off into years’ worth of monthly archives. 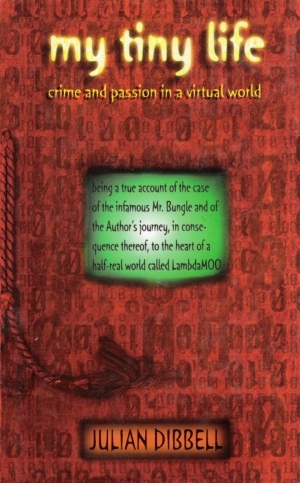 During the first two years of Robot Wisdom, the Web log was Barger’s full-time occupation. Full time: He sat in bed surfing and linking all day long and had, he says, no job to support the habit. Last August, he finally cut back on the logging, limiting it to just a couple hours a day, but only so that he could devote more time to other aspects of the site. He spends the better part of his days working on long-term projects that surround and extend the daily log — link-studded FAQs on various subjects (artificial intelligence, ASCII art, Web logs), Web-resource pages on his favorite artists and authors (Robert Stone, Thomas Pynchon, Joni Mitchell, the Incredible String Band), and above all his magnum opus: a vast hyperlinked and open-ended annotation of Joyce’s Ulysses and Finnegans Wake. His Joyce pages appear to be getting as popular with scholars as his Web log has long been with journalists, but Barger remains a dedicated amateur in both fields, intent on dodging the temptation to professionalize. He has not had good experiences with the traditional workplace. He gets by, he says, with odd bits of contract work (programming, the occasional Joyce article), with loans, and with economies. Serious economies. Well, homemade vegetarian pizza and cheap, supermarket-brand coffee, actually. WHAT IS A WEB LOG, really? The question has taken on some urgency in the last year or so. In the beginning, it wasn’t much of an issue. The earliest Web logs, from the What’s New era, looked distinctly like stop-gap measures, after all — ad-hoc, interim attempts to organize the Web’s burgeoning chaos of attractions, serviceable at best until something more efficient came along. And when something more efficient did come along, in the form of search engines and hierarchical indexes, it seemed safe to assume that Web logs would politely shrivel up and blow away. Instead, though, they evolved, gradually feeling their way toward an unexpected maturity as a form. By now, hundreds of more and less artfully maintained blogs have emerged — Lemonyellow, Boing Boing, and Cardhouse being just a few of the more memorable. There are specialty blogs, their links dedicated to music, or Web design, or Jewishness. A loosely collegial, cross-linking community of Web loggers has coalesced, trading advice, feedback, and support. Software, like the increasingly popular Blogger, is being built to ease the tedious job of daily adding links. And inevitably, money has begun to nibble at the edges of the phenomenon. Master blogger Jim Romenesko has been hired by the Poynter Foundation to maintain his heavily trafficked media-gossip Web log full time; corporations have been rumored to set up in-house intranet blogs to track potential markets and competitors; and arguably, sites like About.com, laced with linky content drizzled out by semi-amateur specialists, have incorporated elements of Web logging into their business models. Also inevitably, articles have been written — in Salon, The New York Times, Wired — consecrating Web logs as yet another New New Thing: At one time or another in the last 12 months, they have been the future of journalism, a budding branch on the tree of literature, or both. Well, no, blogger, you’re not. And therein lies your gift. Because even if it’s true the vast majority of blogs would not be missed by more than a handful of people were the earth to open up and swallow them, and even if the best are still no substitute for the sustained attention of literary or journalistic works, it’s also true that sustained attention is not what Web logs are about anyway. At their most interesting they embody something that exceeds attention, and transforms it: They are constructed from and pay implicit tribute to a peculiarly contemporary sort of wonder. Just so, the Web log reflects our own attempts to assimilate the glut of immaterial data loosed upon us by the “discovery” of the networked world. And there are surely lessons for us in the parallel. For just as the cabinet of wonders took centuries to evolve into the more orderly, logically crystalline museum, so it may be a while before the chaos of the Web submits to any very tidy scheme of organization. If we hoped once to pass immediately from the Web’s Wunderkammer era to its museum age — to fly without a hitch from What’s New to Yahoo! — these days we’re obliged to recognize that indexes and search engines are themselves barely adequate to the job of taming the data storm, that grows far faster than their ability to filter it. We remain in a kind of stupor before the Web’s abundance, and we seem likely to stay in it indefinitely. We might as well learn how to live there. We might also consider enjoying it while it lasts. After all, the passage from Wunderkammer to museum may have been a triumph for Western science, but it was a mixed bag for the Western soul. Wonder isn’t easily replaced once mastery disperses it, and we may sorely miss our wonder at the Web if and when the wonder goes. Better we should savor it now — and what better form to savor it in than in its purest distillation on the Web, the blog? ONE ISN’T BORN a blogger, surely, and yet in Jorn Barger’s case one has to wonder. Decades before there was a Web, he was chasing links through thickets of loosely interconnected data and ideas. When Barger discovered the Net in the late eighties, he threw his ideas at it with all the energy of an author finding his first audience. He became a netnews junkie, posting wit and wisdom to newsgroups from comp.ai to rec.arts.ascii-art to alt.music.alternative.female. He got into flamewars, deeply, some of them going “thermonuclear” and taking up prodigious swaths of his waking hours. His real-life interactions took a dive. “I found that I just spent much more time thinking about the flame wars that I was in than the people that I hung out with,” says Barger. Does it even count as irony that Barger’s rigorously unfiltered perspective is perhaps as good a filter as can be found for the welter of the Web? It practically goes without saying: Accept that the Web ultimately overwhelms all attempts to order it, as for now it seems we must, and you accept that the delicate thread of a personal point of view is often as not your most reliable guide through the chaos. The brittle logic of the hierarchical index has its indispensable uses, of course, as has the crude brute strength of the search engine. But when their limits are reached (and they always are), only the discriminating force of sensibility will do — and the more richly expressed the sensibility, the better. In the end, then, there is at least a little something to the claim that Web logs belong to literature. Deriving full-bodied, believable personalities from the quotidian flow of consciousness is, after all, one of literature’s specialties — especially the high-modernist literature to which Barger has, not coincidentally, dedicated himself. Whether James Joyce would recognize the traces of his stream-of-consciousness techniques in Robot Wisdom’s daily trickle of links is, of course, an open question. But Marcel Proust, who also spent his waking hours in bed compiling an impressive log of life’s detail, would certainly approve. And as for that arch-late-modernist Jorge Luis Borges, whose oeuvre is more or less one long meditation on the themes that haunt information fetishists like Barger, don’t get me started. Well, too late. Borges, as it happens, is curiously absent from Barger’s constellation of literary heroes, but the truth is, Robot Wisdom’s labyrinthine castle of links and annotations would have fit in comfortably among the fables of the Ficciones. Barger’s passions, like those of Borges, are a librarian’s, concerned with superabundances of word and image and the struggle to wrest sense and order from them. Like the hero of Borges’s “Funes the Memorious,” who suffers from the inability to forget a single thing he’s seen or heard, Barger contends daily with a surfeit of memory — the Web’s vast, collective store of recollections. Funes ultimately resorts to cataloguing it all in terms of purely personal associations (he even counts in them, replacing numbers with mental hyperlinks: “Luis Melian Lafinur, Olimar, sulphur, the reins, the whale, the gas, the cauldron, Napoleon, Augustin de Vedia,” and on toward infinity). And so, too, in effect, does Barger. The difference being this, of course: Where Funes is a tragic figure, unable in the end to make anything of the chaos but more chaos, Barger has made of it a cabinet of wonders. As all good bloggers do. That’s brilliant. I like that a lot. Thank you for this essay. Ditto what Mr. Norman Rogers wrote; thanks for writing this essay. Especially enjoyed the conclusions analyzing the web log & literature’s connections. … BTW I cited you in the Preface to my weblog.